Imagine a 100% smoke free sophisticated boutique hotel, whose focus is delivering guest peace, serenity and renewal. Quite deliberately the Hotel Indigo Buffalo-Amherst has been designed as an oasis for travelers who yearn for an escape from the common hotel, but still need the convenience of a 24 hour fitness center, pool, whirlpool, Golden Bean Restaurant.Minutes from Buffalo Niagara International Airport (BUF), Hotel Indigo Buffalo Amherst provides convenient access to downtown Buffalo and is located at the main entrance of the State University of New York at Buffalo North Campus and one mile from the Audubon Industrial Park. Nearby attractions include: Ralph Wilson Stadium, HSBC Arena, Dunn Tire Park, Seneca Niagara Casino, Shopping Malls, Buffalo Zoo, the Theater District and Art Galleries. No visit is complete without a trip to Niagara Falls, just minutes from the Hotel Indigo Buffalo Amherst. 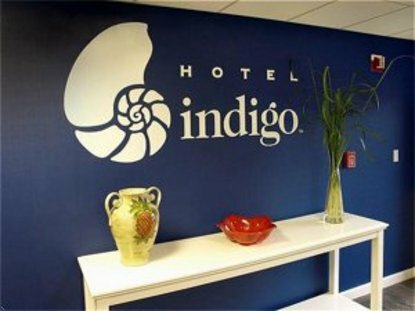 Hotel Indigo offers each guest a blend of modern contemporary living with the best in traditional hotel hospitality. Curl up in our over-sized beds with plush bedding, duvets with covers, pillow shams and plenty of fluffy pillows. Complimentary wireless Internet access throughout the hotel is at your fingertips or use our business center if you prefer.Relax and enjoy our quick serve Bistro &reg Golden Bean for cutting edge cuisine or grab a latte where we proudly brew Starbucks coffee. This hotel is committed to providing accessible facilities under the American Disabilities Act. If your accessibility needs are not met, please contact the Hotel Manager on Duty. Should you require additional information regarding accessible facilities for guests with disabilities, please call 1-800-Holiday (U.S. and Canada) or contact the hotel directly. For the hearing impaired, TDD service is available at 1-800-238-5544 within the U.S. and Canada.